U.S. stocks started November with a strong rally Thursday, following mostly upbeat jobs reports. All three major indexes jumped more than 1%, as Wall Street continues to recover from a two-day trading suspension due to Superstorm Sandy. The Dow Jones industrial average rose 135 points, or 1%, the Nasdaq increased 1.4% and the S&P 500 jumped 1.1%. The gains came as investors parsed through a bevy of corporate and economic news, including planned job cuts, private sector job gains and initial unemployment claims. Those numbers are all a prelude to the government's monthly jobs report , which will be released before markets open Friday. While outplacement firm Challenger, Gray & Christmas reported the number of planned job cuts surged to a five-month high in October, two other reports were positive. Payroll processor ADP said U.S. private-sector employers added 158,000 jobs in October, which was above expectations, and weekly initial jobless claims fell by 9,000 to 363.000 last week, coming in lower than forecasts. "The employment numbers look a little stronger than we were anticipating," said Kim Forrest, senior equity analyst at Fort Pitt Capital. But Forrest warned that doesn't necessarily mean the October jobs report will be stronger than expected. "From all the chatter that we've been listening to during company earnings calls, it doesn't seem like American companies have been doing much hiring," she said. "There may be some job growth at small businesses, but even with that, I'd be surprised to see a strong employment number." Economists surveyed by CNNMoney are expecting the economy to have added 125,000 jobs in October, up from 114,000 the prior month. They're also expecting the unemployment rate to tick up to 7.9%, from 7.8% in September. Meanwhile, U.S. manufacturing activity continued to rebound in October, and the Conference Board's consumer confidence index rose to the highest level since February 2008. Construction spending increased in September by the most in three months, though the jump was slightly less than analysts were looking for. Companies: The corporate world was also busy Thursday. Better-than-expected earnings sent shares of Exxon Mobil (XOM) slightly higher. Netflix (NFLX) shares retreated after a massive 14% runup Wednesday. The previous day's gains came after famed corporate raider Carl Icahn disclosed he bought a 10% stake in Netflix, and strongly hinted he'd like a larger company to buy the streaming video and DVD service. 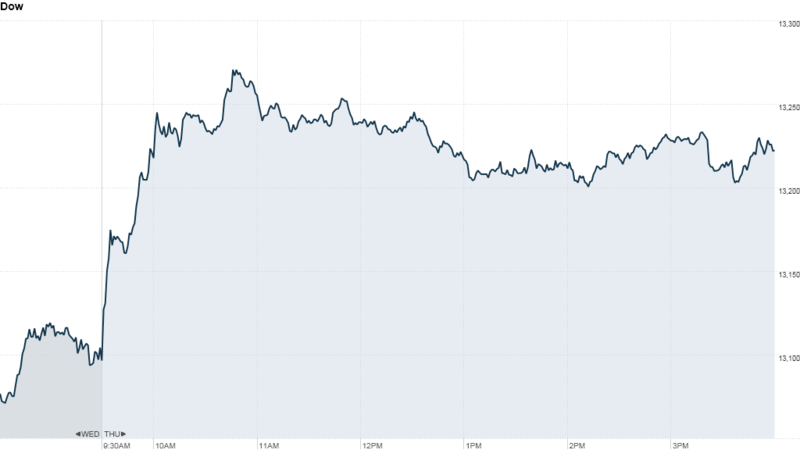 Japan-based Panasonic (PC) released an earnings report Thursday that was full of bad news. The electronics company posted a loss, dramatically lowered its forecast for the year, and announced it will suspend its dividend. Business conditions are expected to become "much more severe." Shares of the company declined. Also in Japan, Sony (SNE) reported a narrower loss for its fiscal second quarter and reaffirmed its full-year forecast for a swing to profit. Its U.S.-traded gained ground. Shares of Ford (F) rose after the company announced that Alan Mulally would remain president and CEO through at least 2014, and named Mark Fields as chief operating officer. 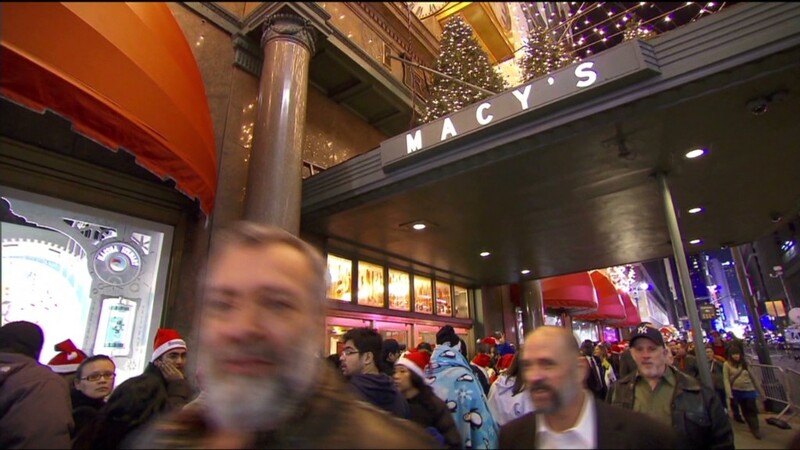 Miracle on 34th St. for Macy's. Shares of Visa (V) gained after its Wednesday earnings report topped analysts' estimates. Sirius (SIRI) also gained after the satellite radio company reported its new subscriber sign-ups were strong last quarter. Pfizer (PFE) slipped after it reported quarterly revenue that fell far below analysts' estimates. GM (GM) said its U.S. sales jumped 5% in October to the highest levels since 2007. After the closing bell, AIG (AIG), Starbucks (SBUX) and LinkedIn (LNKD) reported results. Shares of Starbucks spiked in after-hours trading after the coffee chain hiked its dividend as it beat its profit and revenue forecast. AIG also topped expectations, but shares of the insurance giant slipped in after-hours trading. LinkedIn's stock bounced in after-hours trading after the company topped Wall Street's expectations. World Markets: European stocks closed sharply higher. Britain's FTSE 100 rose 1.3%, the DAX in Germany increased 1% and France's CAC 40 added 1.4%. Asian markets closed higher. The Shanghai Composite had the strongest gains, up 1.7%, while the Hang Seng in Hong Kong jumped 0.8%, and Japan's Nikkei rose 0.2%. China's government reported earlier in the day that its official purchasing manager's index jumped to 50.2 in October, from 49.8 the previous month. Any reading above 50 indicates that factory conditions are improving in the manufacturing sector. Currencies and commodities: The dollar rose versus the euro, the British pound and the Japanese yen. Oil for December delivery added 85 cents to settle at $87.09 a barrel. Gold futures for December delivery fell $3.60 to settle at $1,715.50 an ounce. Bonds: The price on the benchmark 10-year U.S. Treasury edged lower, pushing the yield up to 1.72% from 1.69% late Wednesday.